This article focuses on a common solution for managing shared music files. It is accomplished by keeping shared music files on a single computer and have other computers' media libraries point to, and stay current with, the files on that computer. It's easy to assume that most people with computers have media libraries. As computers become cheaper, easier to network and easier to use, people are more likely to create home networks. Since servers aren't practical in a home setting, information is distributed amongst the computers in the network, which makes managing and finding formation difficult. This is probably most evident in music libraries. Most media players maintain a private database containing all of the songs they're aware of. Keeping these databases up-to-date can be a chore on a single computer, and keeping databases current on several computers often seems impossible. A common solution is to keep all music files on a single computer and have other computers' media libraries point to, and stay current with, the files on that computer. Anyone that has tried this in practice knows that it's an adequate solution, but not an ideal one. Personally, I just want to listen to music, not manage it. My home setup consists of a Windows Media Center computer that drives my TV and has all of my music on it, my workstation, and occasionally a laptop. Keeping the workstation current with the music on the Media Center has always been a hassle, and doing so on the laptop just isn't practical. I wanted a simple, clean way to listen to music anywhere in my apartment, from any computer, without having to worry about the accuracy of the library. I chose to build a little website whose only purpose would be to get me to the music I wanted to listen to as painlessly as possible. I used Microsoft Visual Web Developer 2005 Express Edition Beta 2 to make this happen. Back in the old days we had a technology called COM that let us use libraries written in any language from our code, regardless of the langauge we were using (as long as it supported COM), much like .NET does today. 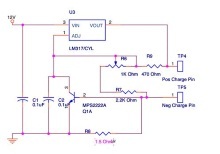 COM did a great job solving some problems, but introduced a few others that became more apparent over time. .NET is, among other things, a solution to many of these problems. Years ago, Microsoft started exposing operating system and application services via COM. This let common folk write code against Microsoft Word, Windows Scripting Host, Windows Media Player, and countless others. Due to the number of languages, frameworks, etc. that support COM, it's still a major player in the Microsoft world and it's common to find COM support in Microsoft applications before .NET support. Luckily, .NET does a great job talking to COM (most of the time). This history lesson is relevant because the site uses the Windows Media Player COM component to access its media library. Adding a reference to a COM component is just as easy as adding a reference to a .NET assembly. 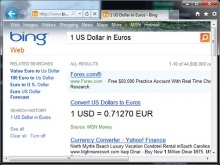 Click the Website menu and select Add Reference, then click the COM tab on the Add Reference dialog. The WMP library is a flat structure of media items, so the Artist -> Albums -> Tracks hierarchy must be created manually while populating the database. Accessing the WMP library is simple; calling the getAll method off of a WindowsMediaPlayer object's mediaCollection property returns a playlist of all items in the library, represented by the IWMPPlaylist interface. Collecting the information needed from each media item (represented by the IWMPMedia interface) is just as easy, via a call to IWMPMedia's getItemInfo method. Once all of the relevant information for the media item is collected, the artist, album and track objects must be retrieved or created. To keep things as simple as possible, we'll make three pages: Artists, Artist's Albums, and Album. The Artists page (Figure 2) shows ten groups of artists at a time. Each time a group is clicked, that group is shown and so on until the user gets to the artist she's looking for. The Albums page (Figure 3) shows all of the albums, including artwork, for an artist. 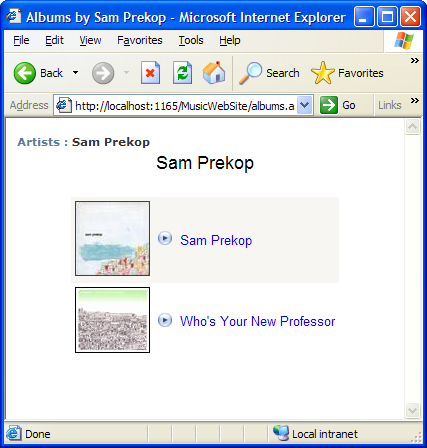 Clicking the album name brings the user to the Album page, and clicking the play button will launch a playlist containing the tracks in the album in Windows Media Player. The Album page shows the large album artwork and tracks. The user can play the entire album or individual tracks. 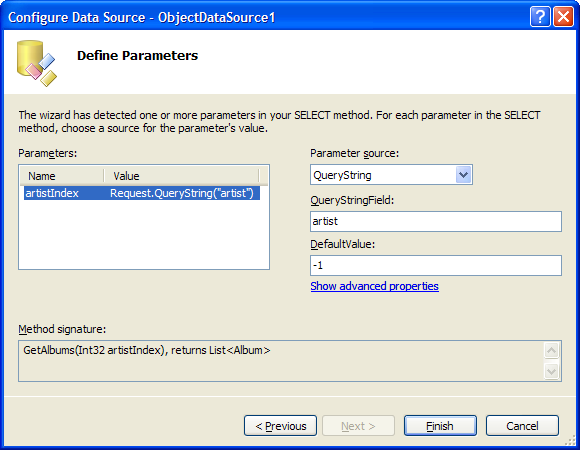 Each page uses object data binding and shares a common master page. 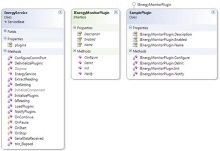 ASP.NET has a new feature called Master Pages, which allows you to create a consistent layout for the Web site and share common functionality without having to duplicate it for every page. The Master Page in this website is used to share Cascading Style Sheet (CSS) information and host the "breadcrumb bar," or SiteMapPath, as it's called in ASP.NET. I won't be covering the SiteMapPath control, but the implementation should be interesting to anyone that needs to drive one programmatically and not through a static definition. 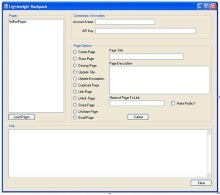 More information about master pages can be found in Fritz Onion's Master Your Site Design with Visual Inheritance and Page Templates. The Albums and Album page also have images and play buttons that launch Windows Media Player playlist files. Album images are cached in a Web-accessible directory, and WMP playlist files are generated on the fly in an HTTP handler. Both of these topics are covered below. 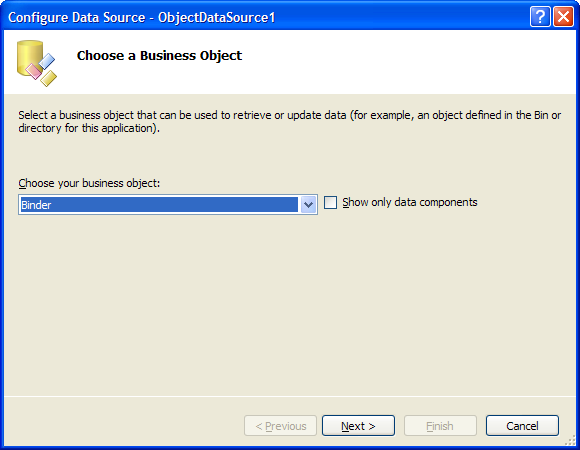 The new ObjectDataSource is the middleman between the grid and objects. 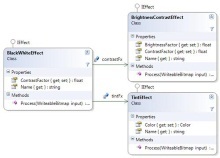 It must be configured to work with a class to return data requested by the grid. We'll step through creating the data source for the Albums page. The "Binder" class is selected as the business object. The objects used to represent the artists, et al, are simple and primarily represent data, and therefore don't have much in the way of persistence methods. The Binder class provides the functionality that may otherwise be handled by the objects themselves. The next page is where we choose which method we would like to use to get the data, so we pick GetAlbums. 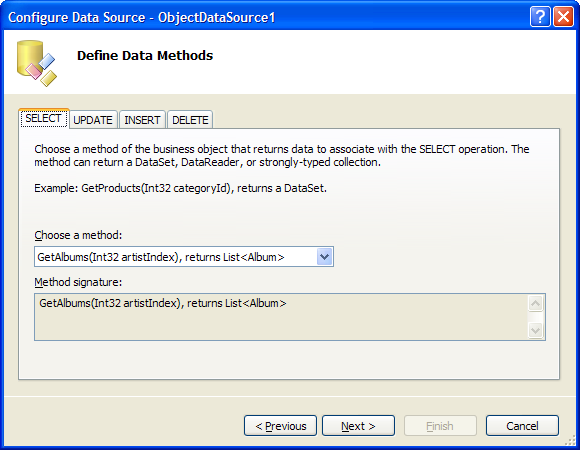 Update, Insert and Delete methods can also be specified, but are not required. 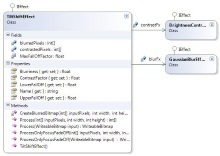 The final page specifies where the parameter values will come from. The value can come from one of the following: Cookie, Control, Form, Profile, QueryString and Session. Once the data source is configured, setting it as the DataSource of the grid is all that's required to make the magic happen. All of the grids use template columns and custom code to generate their hyperlinks. For example, the artists page (figure 2) consists of a single GridView that's bound to a generic List of RangeListItems. RangeListItem is a custom class that represents the first and last artist IDs in the range, as well as the text that is displayed in the grid. The hyperlinks are created by using a template field in the grid and calling a method in the page's server-side script section. More information about templates in ASP.NET 2.0 can be found in Dino Esposito's Move Over DataGrid, There's a New Grid in Town!. 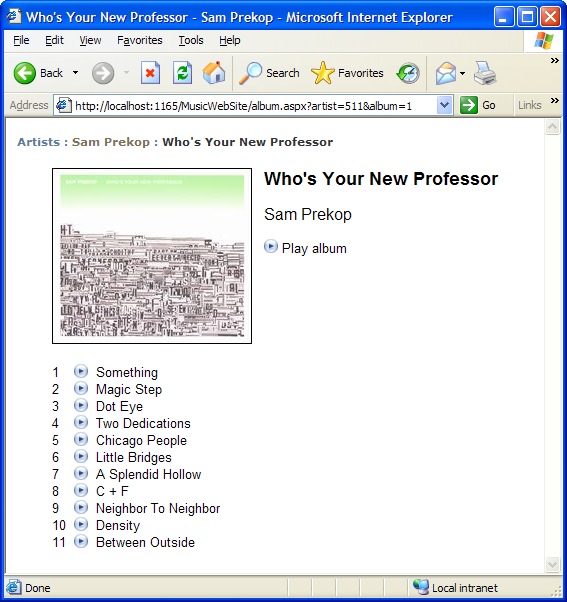 Windows Media Player downloads album art, both large and small versions, when possible. These image files are stored in the same folders as the album tracks, but are hidden by default. 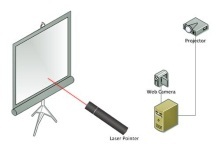 These images must be copied to a child folder of the Web site so the browser can access them. This is done by first finding the correct image, then copying that file to a subfolder of the Web site and giving it a unique name to so it can be more easily retrieved the next time it's required. If album art isn't found, a small transparent image is used instead. 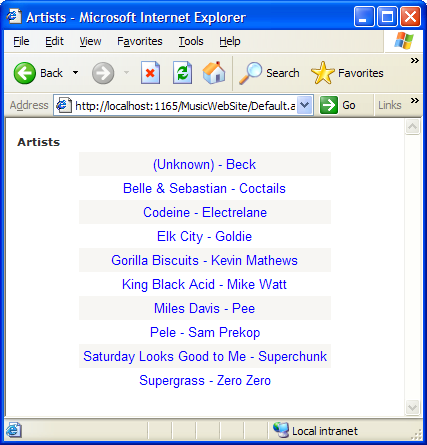 Playlists are created by the PlaylistCreator class, which is a lightweight web request handler that implements the IHttpHandler interface. The handler is quite simple: It writes out a header, notifying the browser that the type of content it will be returning is "video/x-ms-asf", then creates and returns an XML playlist. The content type header helps the browser determine what to do with the content, and is a very important step since we want to play the playlist, not show it in the browser. ASP.NET knows how to handle requests to ASPX pages: it finds the page with the same name and executes it. HTTP handlers are handled a bit differently. An entry must be made in the web.config file associating a file name or pattern with the type of the object to use to handle the request. 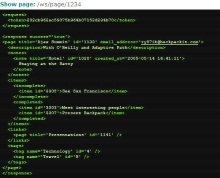 The XML fragment below is from the configuration/system.web section of the web.config file. 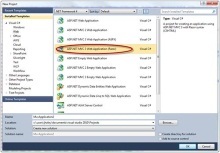 It's instructing ASP.NET to direct any request with an extention of "wpl" to an object of type "PlaylistCreator". This is useful code. I will and test and see if it works with all the formats. But on Page.PostBack I cannot access the Media Player that I was controlling from the previous page. All I can access is the new instance of the media player created after my postback oocurred. I am not handling anything via client side. @Emmanuel: Use a BLOB datatype. How do I access the "Add to Library" functionality from C# or c++? I can only make this work using Cassini. If i use IIS, it doesn't detect any of my music files. What am i missing? 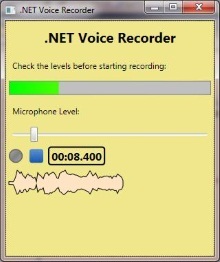 i need to develop an web application in such a way that the audio files will be stored in a server and i need to play those audio files from an asp.net page i.e i should be able to share the music to all user. more over you havent given how to create the database. @varadharaj: I believe we've covered databases in a different area. From looking at this, it should play. With that said, I think I'm going to create a new version of this article since I tried to run it and couldn't get it to run very easily. I have just begun to use Microsoft Visual Web Developer 2005 Express Edition version 2.050 727-7600. For development I am usinng the ASP.NET DEVELOPMENT SERVER that is installed with the developer. Server Error in '/VisualBasic' Application. 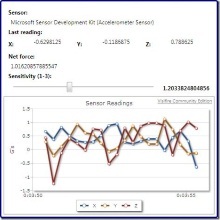 Can COM controls be conveniently used in visual web developer.net express edition? Some users say no!! I'll work on reencoding this project in a VS Friendlier solution. This is one of our projects from Coding4Fun version 1 so it could very well be much older than the date listed above. can you please upload the zip file so i can study, thank you. I'm sorry but it is very hard to follow your code and your explanation above does not help. THis is supposed to be coding for fun, not code that will frustrate the hell out of you. What is the WMPLib.dll? What is the starting point of the app? Where are you getting the artist that come up when you run the app? 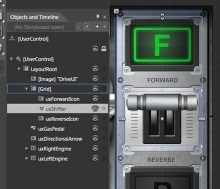 Why in your instructions you say to change a line of code that when you change it HAS NO AFFECT ON THE APP. Why when I click on the config for the ObjectDatasSource it gives me an error saying "The type Binder could not be loaded. If the type is located in the App_Code folder, please check that it compiles." What does that mean? I'm sorry but this is very frustrating. Try to explain your code better. But if I get rid of this line completely and leave it blank the app still gives me that default list of artists. What's going on????????? Have you fixed this yet so it works over the internet? Your application is loading every single artist and it's all albums, tracks on default.aspx into the memory. Is not that too much to load? if I had 5,000 University students using my music server per minute? If it is how would you solve it? May be the design patterns you are practicing just off the shelf and not meant for large scale software? i think it's a great article and does say level: intermediate! definetly was fun for me! If you don't get it, don't worry ...others do! @Avaz, You can cache the page. I'd cache it for an hour or longer depending on how often the music collection changes or how often you want it to update. No matter what, if you have 5000 people accessing your computer, your hard drives may have a hard time keeping up. Figure 5MB a song, song is 3 minutes long (so 1.66MB/min), that comes out to be 8.3 gigs worth of data transferred every minute. I don't think this was designed for the scenario you're describing. For IIS you may need to configure the Windows Media Player Network Sharing service to run using LocalSystem account. The IUSR account's media library might also be empty. I wonder if there is a way to work directly with the WMP database? Husshh..!! Finally my search ends here..!! This article helped me a lot..!! Sorry I've slammed so many comments but, have been hacking all weekend and i'm generally one to keep on even when i think i've hit a wall. but when i use the built in VS server, seems things work as expected. I've gone so far are to run my AppPool using my id/pw along with configuring my site also to use my id/pw. Odd thing is that the PlayLists exposed don't even show up in the PlayLists tab for Window Media Player. I've compiled a project in VS2008 against 3.5 on a Windows 7 x64 rig and when run using the VISUAL STUDIO DEVELOPMENT SERVER, it runs without a hitch. But when I run in IIS 7 (same machine), I can load the Default.Aspx, but seems no code is actually kicked off... Ideas? @Bill Roberts RE: IIS7 issue, do you have IIS with dynamic content enabled? for super easy configuration, I tend to use Web PI. http://microsoft.com/web/ to get IIS setup quick.